The school had an Art in the Park night where they show cased each students art work! We went to check out their art work. 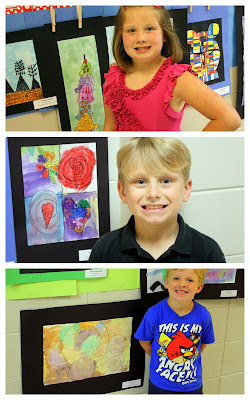 They were all excited to show me their art piece they chose to place in the show. I think they turned out really good... I can't wait to frame them and use them! Brylee, Jackson, and Zac with their Art Pictures!!! Brylee with her "Ice Cream for Daddy"
She told me she picked this picture because it reminded her of her daddy! Fun Times with all my Little Artist!!! !